A wide-ranging account of the place Goa occupied both in India and the world beyond, before the advent of the British Raj. It was the capital of an European maritime empire that teetered on the brink of collapse in the tumultuous seventeenth century, only to become a thriving cultural, religious and diplomatic hub in the 18th century, building close relations with the foremost continental empires of the day — Mogul, Maratha and Mysore. The globalisation of trade in the 18th century restored its former Atlantic ties via Brazil and the development of the African slave trade, while also opening doors to the Orient, via China and the opium markets. Within a century, however, it was but a modest outpost of the bustling Bombay. If you come across a 622-page book, you might assume that it’s going to be a tough read, something that you would find uneasy to plod your way through. Ernestine Carreira’s *Globalising Goa* however manages to make itself fairly interesting, perhaps because of its focus on a subject that interests us here, and also its interesting and well-translated style. Through a common historian friend, Dr Fatima Gracias, we got in touch, and Dr. Carreira mentioned her then plans on the upcoming work. Ernestine Carreira is a senior lecturer in Portuguese history at the Université d’Aix-Marseille in France, and of Portuguese origin. Some years ago, professor George Coelho (better known in Goa for the book *Goa: Continuity and Change*, which he co-edited with Prof Narendra Wagle of the University of Toronto’s Centre for South Asian Studies in 1995) opined that Goa was undergoing a cultural renaissance of sorts. We all also like to believe that we are special on the field of global history. But how much of this is real, and how much is make-believe? Often, in our part of the world, history mingles with fiction and mythology. We simply believe what we want to believe; whether there is any correspondence with reality or otherwise. Carreira’s book steps in here, by trying to explain the ‘big picture’ of how Goa fits in into the global historical jig-saw puzzle, while not at the same time ignoring the small details that lend authenticity and verifiability to the mosaic she paints. After studying the field for some two decades, Carreira attempts a “wide-ranging account” of the place that Goa occupied both in India, and beyond before the advent of the British Raj. In other words, before the juggernaut of the British eclipsed the rest of the South Asian story, and prior to Bombay becoming the urbs prima — India’s premier city without contest. Goa then was, Carreira reminds us, the capital of a European maritime empire that teetered on the brink of collapse in the tumultuous seventeenth century, only to become a thriving cultural, religious and diplomatic hub in the eighteenth century. It managed to build “close relations with the foremost continental empires of the day — Mughal, Maratha and Mysore. The globalisation of trade in the eighteenth century restored its former Atlantic ties via Brazil and the development of the African slave trade, while also opening the doors to the Orient, via China and the opium markets.” Quite a lot for a tiny place! But nothing continues indefinitely. Within a century, Goa became “a modest outpost of bustling Bombay.” Unfortunately, political correctness today dictates that while we often focus on the warts of the past, we do not equally focus on its less unpleasant sides! Specially as far as Goa goes…. 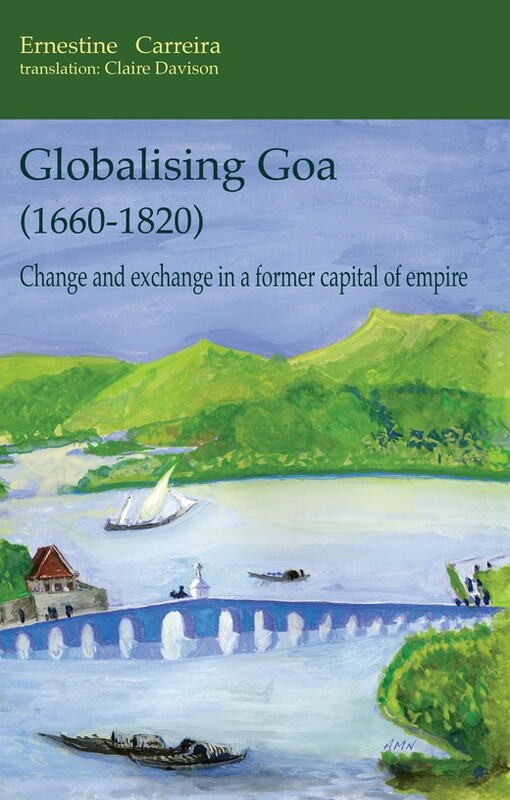 Globalising Goa, which is adeptly translated by Claire Davison, is divided into four parts with a total of eleven chapters. The first part attempts to locate Goa within and beyond Portuguese “imperial dynamics”. Here, we run into how a maritime state was built (1650-1720), the ascendancy of Goa (1730s-1780s), and the “Atlanticisation” of Goa (1760-1822). The latter comes about around the time of Lisbon’s growing concern to ensure the Estado survived in India despite the Maratha expansion, tensions following the Seven Years’ War, new initiatives in diplomacy by Goa, and the repercussions of the American War of Independence on India after 1788 when the English and French clashed in the Indian Ocean. Carreira connects the Goan scenario with the global reality. For instance, the situation continued to be “troubled” in India at the end of the American War of Independence in 1783. Portuguese-ruled Goa managed to set up lasting diplomatic ties with the Maratha Confederation, when Tipu Sultan’s sudden rise of power “exacerbated the upheaval in the continent”. She tells us of how both French and British companies in India wanted to buy out the Estado da India ports between 1661 and 1813. There were indirect take-over strategies too between 1730 and 1792, which actually played out between 1793 and 1813. In this part, Carreira also looks at French officers serving in Goa. Her location in Aix probably gives her a head-start in work on such a theme. Part 2 looks at Goa as a “Catholic nation” in western India, at a time when religion was a dominant marker of identity. This perception shaped Luso-French relations in an India of the Dupleix Era, she contends. She looks at information and commercial networks of the time, Franco-Portuguese solidarity in India, and French expansionism between 1748-1754. Her work takes us to Goa and French establishments on the Malabar coast, and outposts such as the crucial link of Surat in the 17th to 19th century. Part 3 focuses exclusively on Goa in global trade. Here, we encounter centuries-old globalisation, currencies from Goa and elsewhere like the pataca (the Spanish American dollar), American cash flows in Asia, and currencies prior to Brazilian independence in 1822. Goa’s slave-trading networks are also looked at here. Finally, in Part 4, Carreira turns to the “imagination” (or projection) of Goa in writing across the centuries. She looks at travel journals, the depiction of Goan women as stereotypes in Western travel narratives, and how this evolved over time. In her last chapter, she looks at more realistic depiction of Goan women, religion, society, miscegenation and social classes. For a patient reader, there is much to glean from here. This struck me as a book that might not just interest the professional historian, but anyone with a deeper interest in understanding Goa. It should be fairly apparent by now that, given the shared and intertwined histories, both scholars in Portugal and in Goa have been creating work which would be of interest to each other. Five decades should be enough time to overcome the bitterness of the past, and see how such scholarship can help us understand each other — and ourselves. But translation does remain a major issue. Which is why networks in Goa and in Portugal need to work hard to build more translation talent here. Some time back, organisations like the Fundacao Oriente helped to stimulate book publishing activity in Goa by offering grants for books brought out here. One feels they could contribute much more if they encouraged the building of translation resources. With so many (even if it seems small, the number is significant) students studying languages like Portuguese in Goa, it’s perhaps time to include an add-on translation studies module, that would encourage them to take the next logical step. Such knowledge could help them significantly, and definitely not for use in Portugal alone. 2014. 622 pp. Rs 500. Goa,1556.